Headgear primarily for men that appeared at the end of the 19th century; it is made of stiff felt with a circular rounded crown and an upturned narrow brim. 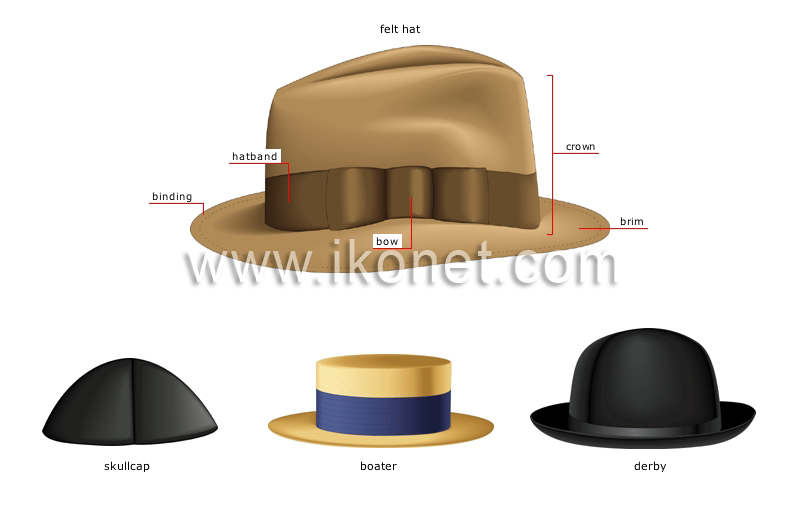 Small round cap covering only the top of the head. Stiff straw headgear with a flat brim of uniform width and an oval crown circled with a ribbon; it was worn at the end of the 19th century. Part of the hat encircling the base of the crown. Point where the ends of the hatband are tied to trim the hat. Strip of fabric running along the edge of the hat. Wide silk ribbon decorating the base of the crown. Part of the hat that fits on top of the head.